that was easy to fix. The sealing gave away and the recent thunderstorm with heavy rain introduced water to the circuit. Which it didn't like. The +12V track was entirely corroded away. Fixed. The Beacon is operating again. I was listening the beacon today from about 19:30 till 20:00 UTC. 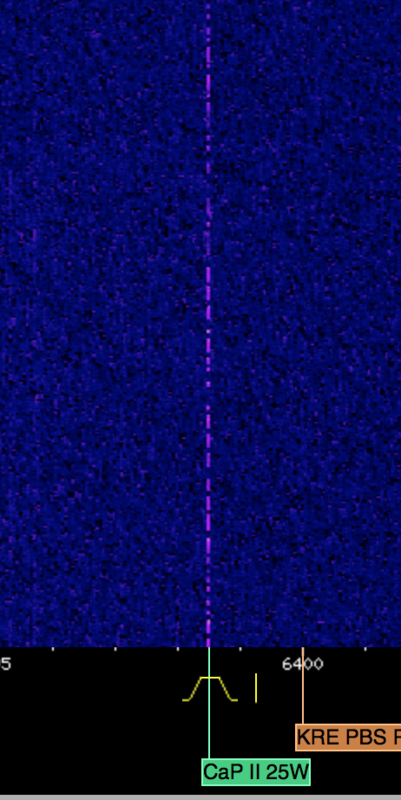 faint but stabil signal, S1 T4 Q3 with moderate fading and noise. First time I've heard this beacon for quite a while. Good copy in New Hampshire, S2 with the noise level S2-S3. Arghl. Sorry for the late reply. I read it back then but forgot to anser. Many thanks for the video. It's alway nice to know where it was received. Oi, nice! It's been quite a whiiiiiile since I got reports from 'the other side'. AFAIK it was in early spring. So it's a seasonal depending connection I guess. Many thanks. Late in the show here, but aren't class D and E just the cat's nose? Only limited by available saturation current. At 80 percent eff. that a swell little AM transmitter at 80/4 carrier power. 20 watts! Did you try amplitude modulating it? Only a cheap monaural amp would be needed. Of course only should be said filtering the output to a close sinusoidal signal would be needed. Late in the show here, but aren't class D and E just the cat's nose? Class D mimics an analog signal by filtering a PWM signal (x-times oversampling equired for quality) though a low pass. Class E generates a sine signal directly from a rectangular signal that equals the target frequency. Conversion between REC and SINE is done by a CCL filter at resonance. In the core, yes, in both types convert a "digital" signal to a analog one by filtering. 20 watts! Did you try amplitude modulating it? I set it to 20W. The shown board is capable of delivering 60W peak carrier from 12V. Likely more with other components. Class E is fairly easy to upscale. About modulation: yes, whatever can supply with with a positive-wing-only-signal works. Some classy monorail amp with the blocking cap on the output removed will do fine. Or some cheap Opamp-Stuff. Or, if you like to stick to "keeping it efficient": some PWM Amp. Update. Same issue as here.